A day off. An abundance of fresh eggs, beginning to overwhelm. What’s a girl to do but some grainless baking? Seriously, who needs to dye eggs with these beauts? 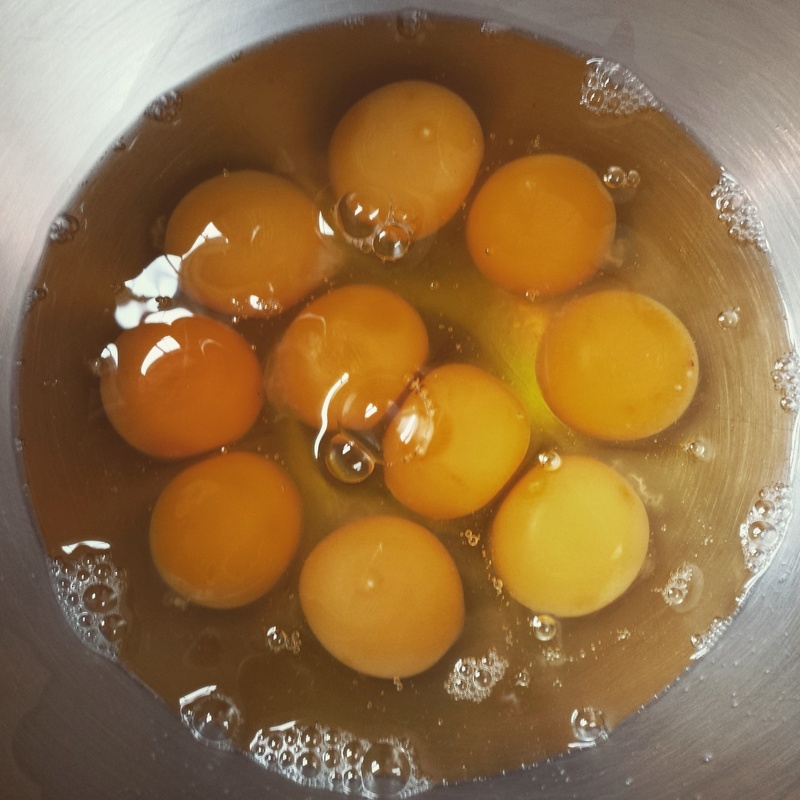 When you bake using a flour that’s made from nuts, seeds, or coconut, you need lots of eggs in order to provide substance, lightness, and something that binds your mixture together. It’s an expensive endeavor if you do it frequently, unless you’ve got yourself some healthy, egg-laying pets – in which case, it’s a perfect way to use up those bad boys. A lot of nut flours and produce breads and desserts that are beautifully delicious, but coconut flour is my favorite, by far. It’s perfect for its sweetness and nourishing properties. In case you didn’t know – coconut is really good for us, you guys. It is rich in important dietary fiber, and is high in really great fat – those medium-chain triglycerides that have lots of antimicrobial, antifungal, and antiviral properties, in addition to boosting your metabolism. We could probably all use more coconut oil and coconut flour in our lives. Nut flours are tasty and good in small amounts, but the fat in nuts is polyunsaturated and too much can cause inflammation in our bodies. ANYWAY. Look at those orangey yolks. 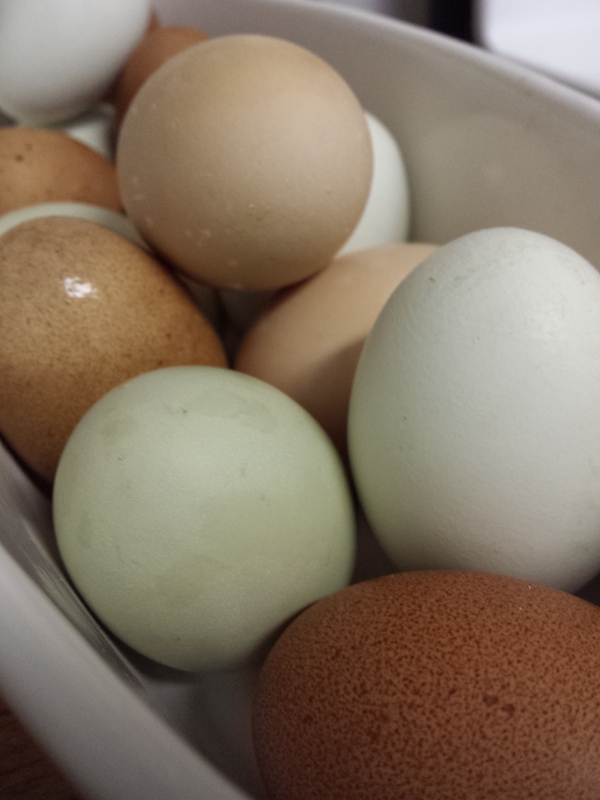 The yolks are darker in color the more greens and bugs the ladies get to eat. The cake (10 eggs) was fantastically easy to make, but the frosting recipe (four eggs) is relatively time-consuming, and would have been more so if I didn’t have a stand mixer. In my opinion, if you actually have the time, it’s totally worth it. 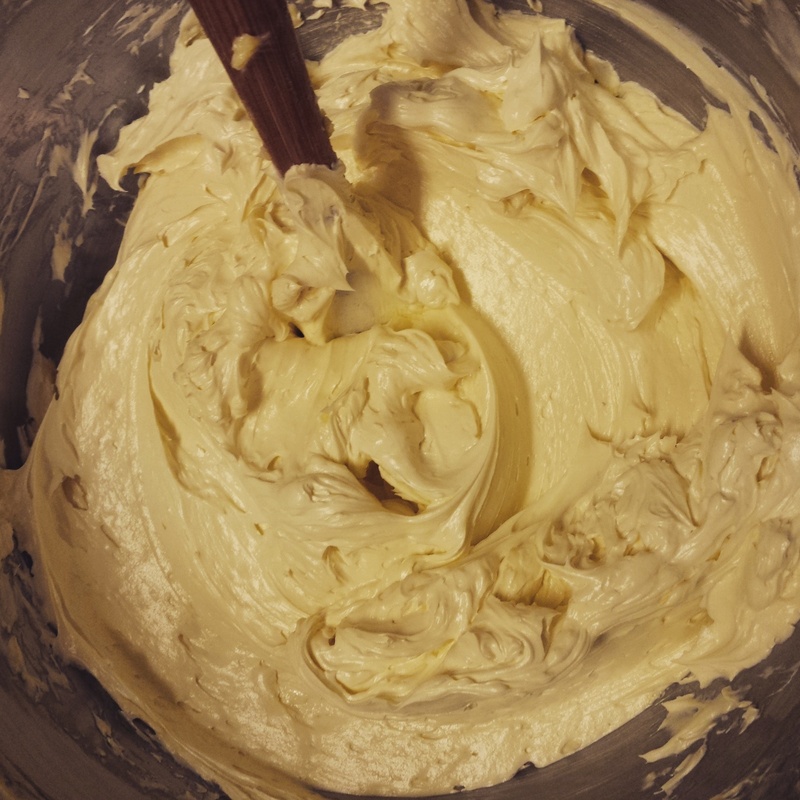 Real buttercream is so. good. And the way I made it, substituting the sugar and water for local honey, makes it a totally real food. Love it. Worth the effort (the stand mixer put in). This recipe makes for a light, very moist cake – tinged with orange and topped with strawberries, it’s reminiscent of that feeling of transition from the cool citrus-bearing months to the warmer, berry-picking days of spring and summer. The amount of batter works great as a two-layer cake in 9″ cake pans, but I currently don’t have any matching cake pans. I have one 9″, one 8″, and one 6″ – so I decided to get a little fancy and tiered. 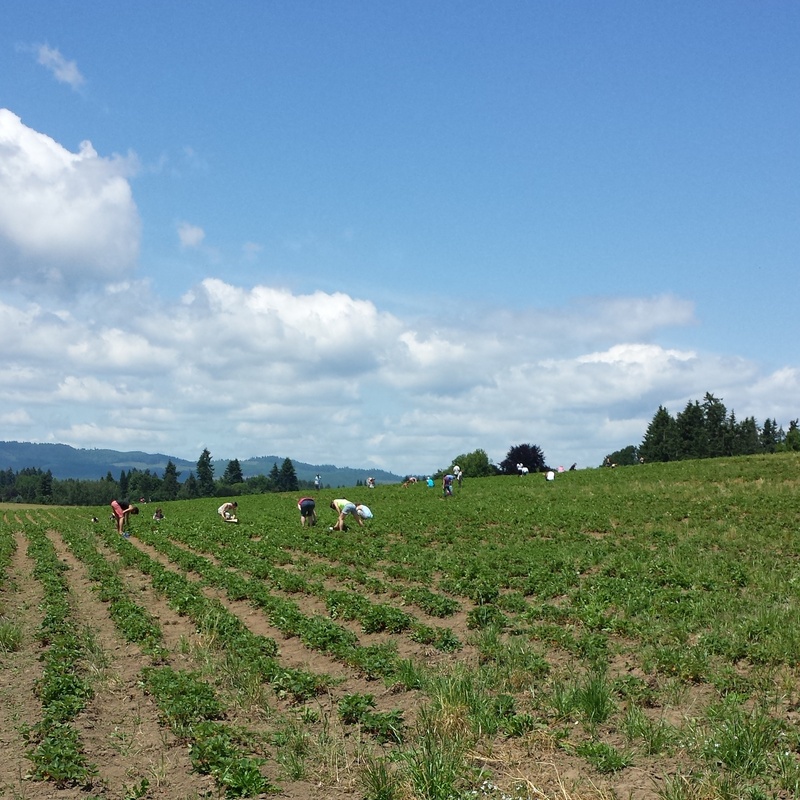 Last June, Joe and I picked our weight in strawberries at Kruger’s Farm on Sauvie Island in Portland. We ate many of them straight, Joe especially enjoying the distinctive Northwestness of them. The California berries he grew up with are giant, white in the middle, and remain kind of solid until they’re mushy. Oregon strawberries are small and plump, red all the way through, each one of them as messy with juice as a peak-season peach. (One of my favorite cookbooks calls those peaches “bend over peaches,” since you have to lean forward to avoid dribbling the juice all over yourself.) Joy. 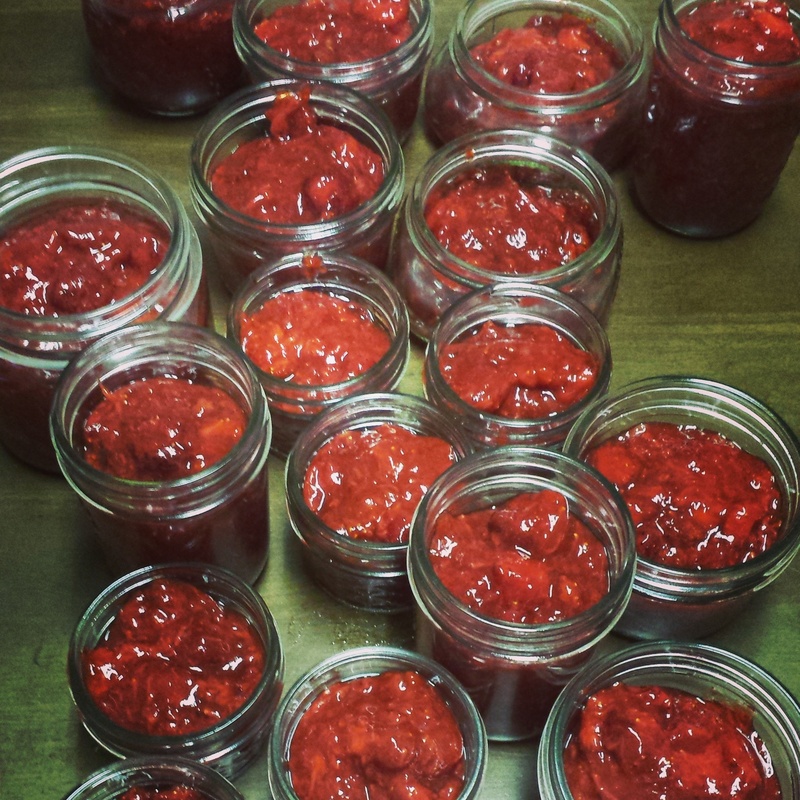 Other strawberries went into this honey-sweetened freezer jam, of which we are still enjoying the last jars. 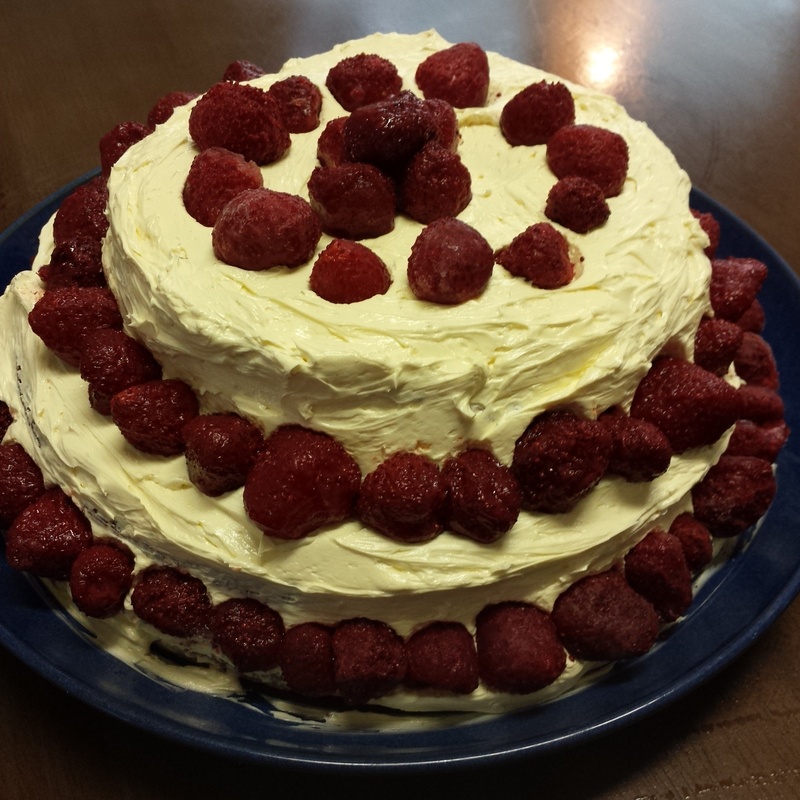 Still others were frozen for smoothies and sundries, and that was the category I pulled from to decorate this cake. 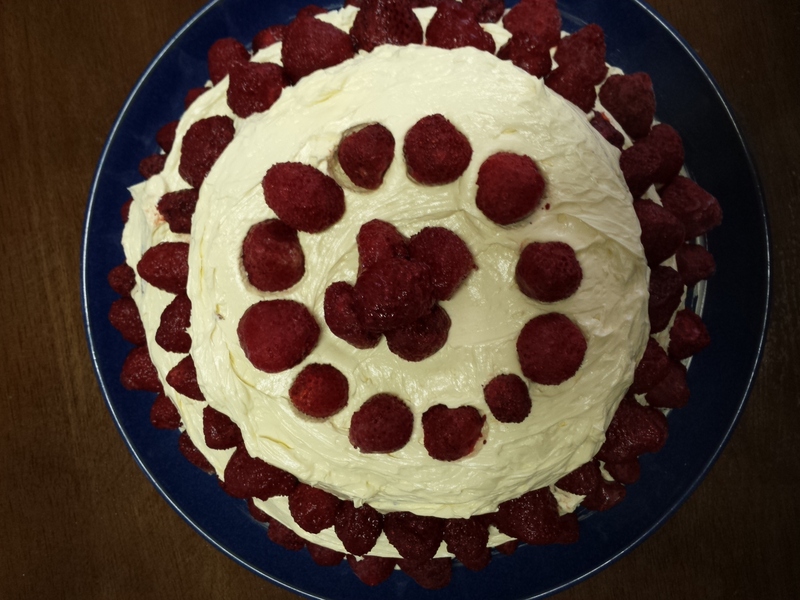 The tartly sweet pop of the thawed strawberries is a great complement to the honeyed sweetness of the cake and frosting. 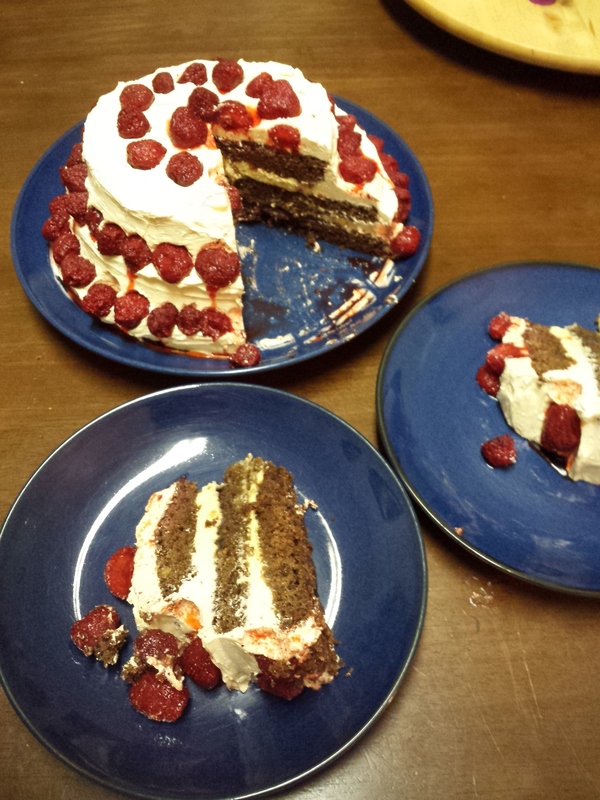 Plus, as the berries thawed completely, their juices ran down the cake a bit, giving it a zombie-esque appeal and further enhancing the taste. Mix the dry ingredients together in a small bowl. Mix the wet ingredients in the bowl of a stand mixer until completely blended and a bit frothy, making sure the coconut oil is incorporated well. Add in the dry ingredients and mix until just blended. Pour the mixture into greased cake pans (I coconut-oiled mine, then very lightly dusted them with coconut flour). Bake in a 325-degree oven for 30-45 minutes. I set my timer for 30 minutes, then check it with a toothpick every five minutes until the toothpick comes out clean. Basic cakery. When it has completely cooled, frost and strawberry the thing, then eat it with friends and family! 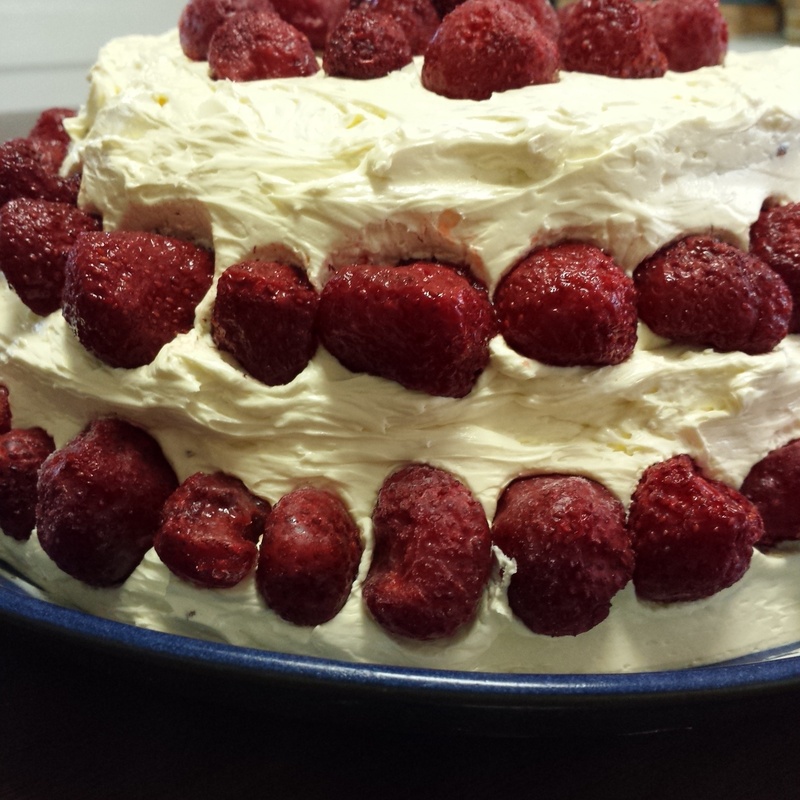 This cake keeps well in the fridge for a few days, or until it’s gone, whichever comes first. 04 Apr	This entry was published on April 4, 2015 at 3:43 pm. It’s filed under Collection and tagged backyard chickens, buttercream, cake, chocolate cake, chocolate orange cake, coconut, coconut flour, coconut flour baking, coconut flour cake, coconut flour chocolate cake, coconut oil, eat local grown, eat real food, grain free baking, grain free chocolate cake, grain free chocolate orange cake, grain-free cake, local honey, real buttercream frosting, strawberries, sugar free, use up eggs. Bookmark the permalink. Follow any comments here with the RSS feed for this post. Wow, Beautiful! I will definitely try this recipe when we have fresh strawberries and when I can eat them with out problems. Looks delicious.